New research shows that some old stars known as white dwarfs might be held up by their rapid spins, and when they slow down, they explode as Type Ia supernovas. Thousands of these "time bombs" could be scattered throughout our galaxy. In this artist's conception, a supernova explosion is about to obliterate an orbiting Saturn-like planet. Thousands of ticking time bomb stars set to explode at any moment are hidden throughout our galaxy, according to a new study. When massive stars reach the end of their lives, they can explode in fiery fits called supernovas. Astronomers calculate that about three stars explode in a specific category of supernova called Type 1a every thousand years in the Milky Way. That means that within a few thousand light-years of Earth there should be dozens of stars on the verge of exploding. "We haven’t found one of these 'time bomb' stars yet in the Milky Way, but this research suggests that we've been looking for the wrong signs," astrophysicist Rosanne Di Stefano of the Harvard-Smithsonian Center for Astrophysics in Cambridge, Mass., said in a statement. "Our work points to a new way of searching for supernova precursors." Di Stefano and her colleagues offer a new model for how these stars explode that could explain some niggling unsolved mysteries. The reigning theory behind Type 1a supernovas is that they are caused when old, dense stars called white dwarfs slowly steal mass from nearby companion stars until they reach a tipping point, becoming too massive to fight against the inward pull of gravity, and collapse. This weight limit, about 1.4 times the mass of the sun, is called the Chandrasekhar mass. But if that is the case, scientists would expect to find these companion stars left over after supernovas fade from sight. 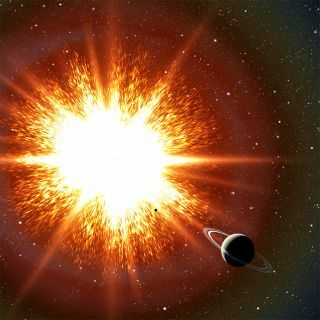 They also predict small amounts of hydrogen and helium gas would have been left nearby, representing material that wasn't sucked into the white dwarf, or that was dislodged from the companion in the explosion. Yet none of these smoking gun clues appear to be present around known supernovas. Perhaps, Di Stefano and her colleagues propose, white dwarfs are able to reach the Chandrasekhar mass but postpone the inevitable by spinning quickly. As a star gobbles up more mass, it also increases its angular momentum, which causes it to spin up. This increased spin can act as a stabilizing force, allowing the white dwarf to tip the scales over the Chandrasekhar mass without exploding. After the star stops eating its neighbor's mass, however, it will gradually slow down, and eventually succumb to gravity in a supernova. Yet the spinning effect could give the star a buffer, perhaps of up to a billion years, between when the white dwarf stops accreting mass, and when it explodes. During this lag, the leftover gas from the companion star may dissipate, and the companion could evolve into a white dwarf itself. "We don’t know of any super-Chandrasekhar-mass white dwarfs in the Milky Way yet, but we're looking forward to hunting them out," said co-author Rasmus Voss of Radboud University Nijmegen in the Netherlands. The researchers reported their findings in the Sept. 1 issue of The Astrophysical Journal Letters.